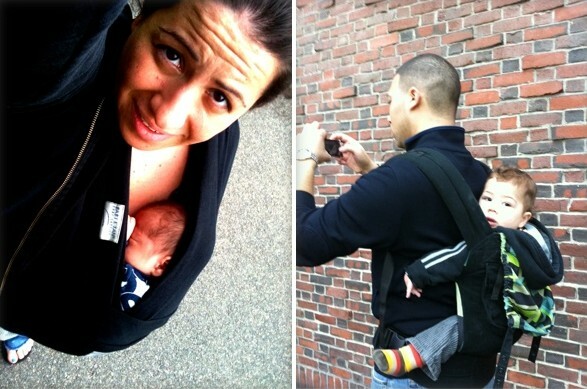 This week we asked: What does babywearing look like in your family? 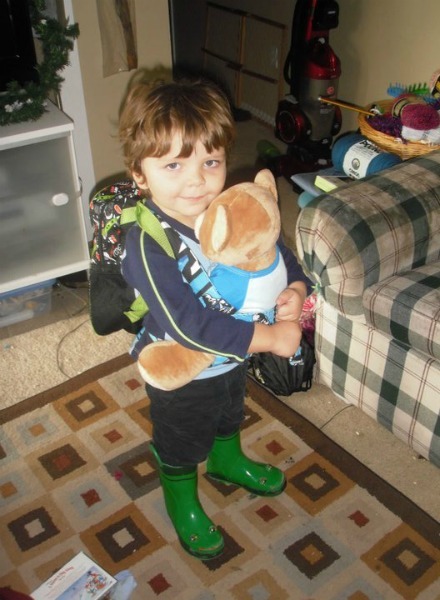 From Alicia: Bear-wearing! 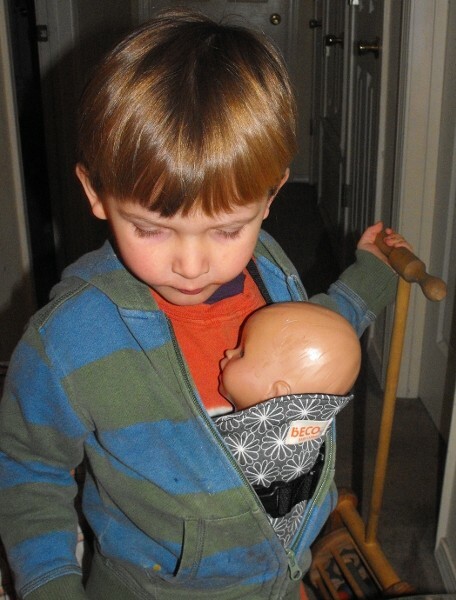 Alicia’s kids have enjoyed using their own doll carriers. Here they are each around 2 years old. 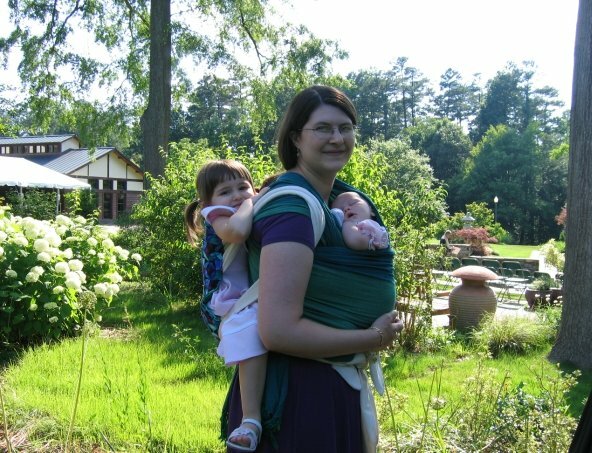 Double babywearing! Alicia wears both of her kids at a wedding. Sweets is 1 month old in an Ellaroo woven wrap. Munchkin is 3 years old in a Sachi Mei Tai. 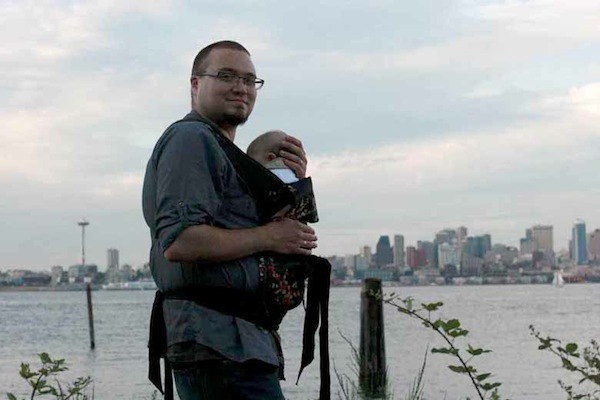 From Jessica: SUPERDAD– in so many ways. 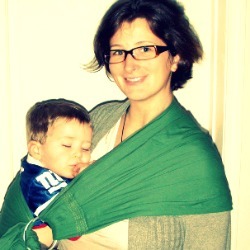 Laura of WaldenMommy: Life Behind the Red Front Door wears BigBrother (then 12 months) in a homemade sling at a wedding. He was so comfortable he feel asleep even amoung the music and noise of the reception. 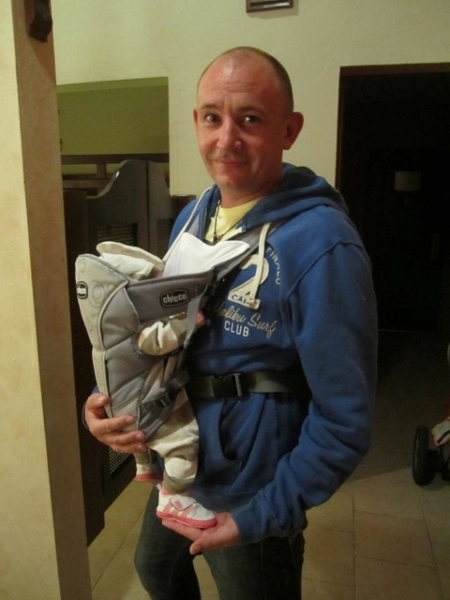 From Lani: Both dad and mom have enjoyed the benefits of baby wearing! It has helped us to be closer not only physically but emotionally. From Jennifer: DC By Sling: It Is the Only Way. Jennifer blogs at Our Muddy Boots. From Lisa: Daddy getting in on the act : ). 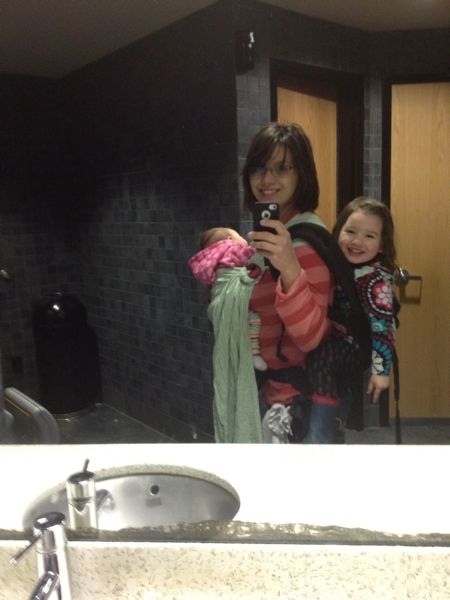 From Claire: Babywearing times two! Peanut (3 years) wanted to ride on mama’s back during a grocery store trip since Twig (6 weeks) was riding on her front. 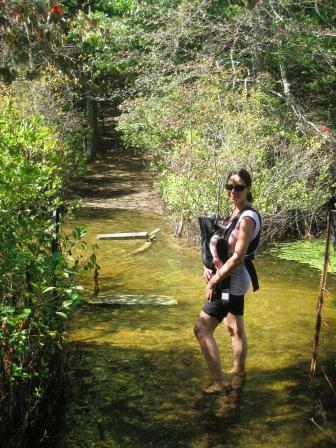 Claire blogs at The Adventures of Lactating Girl. 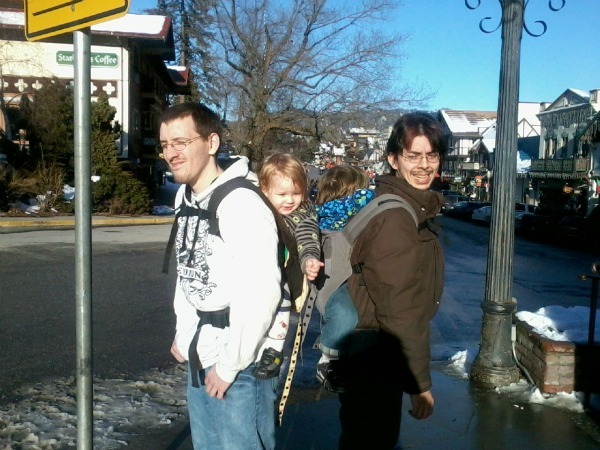 From Jennifer: Not just for mommy, but daddies and uncles too! 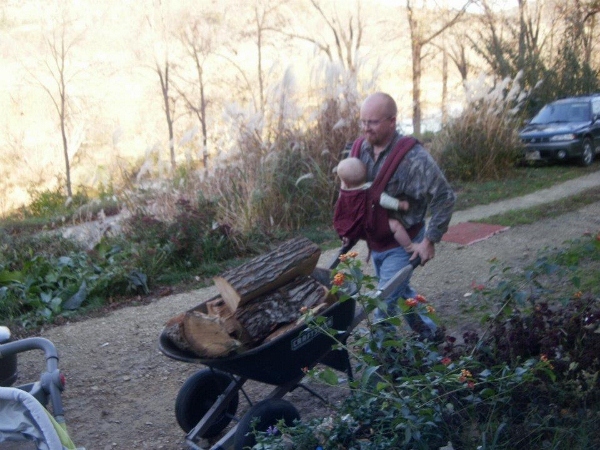 And when you show boys that men can be nurturing, boys learn to be as well! 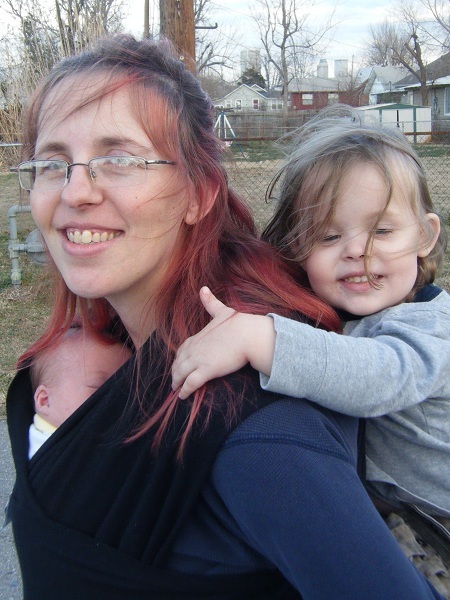 Stephanie blogs at Mama and Baby Love, where she shares a few more babywearing pics. 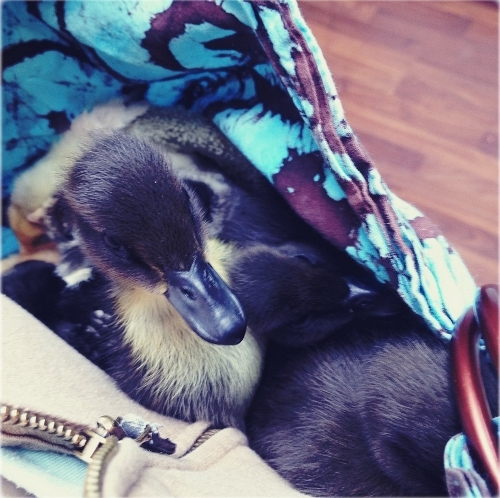 From Lori M: Mommy and Me. From Dara: Maris and Mommy on an early spring hike at our local nature preserve! 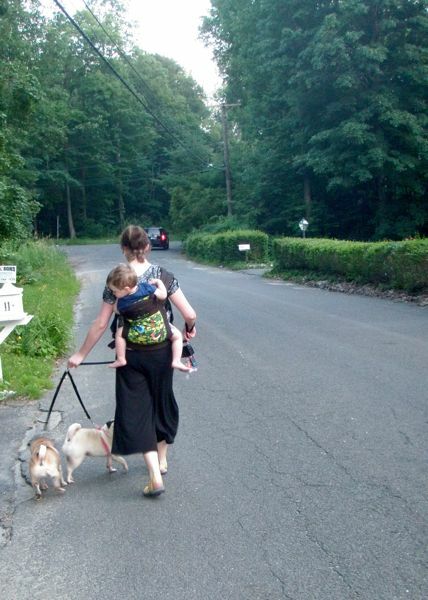 From Shannon: Babywearing makes meeting new people a safer prospect for very little ones. 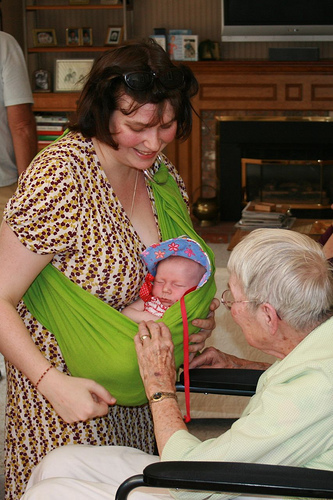 Great Grandma can take a peek, while baby is still close to momma. 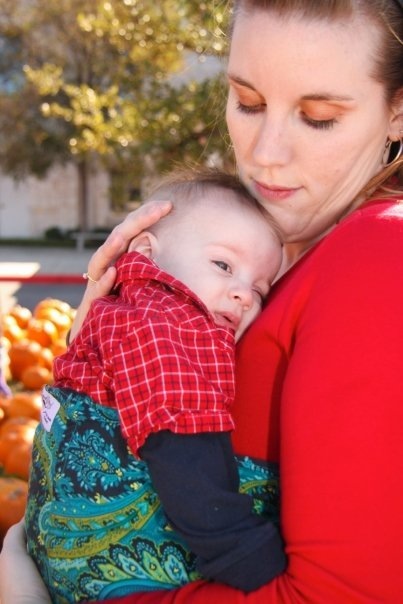 From Cynthia: Happy baby snuggling with Mommy in a mei tai. 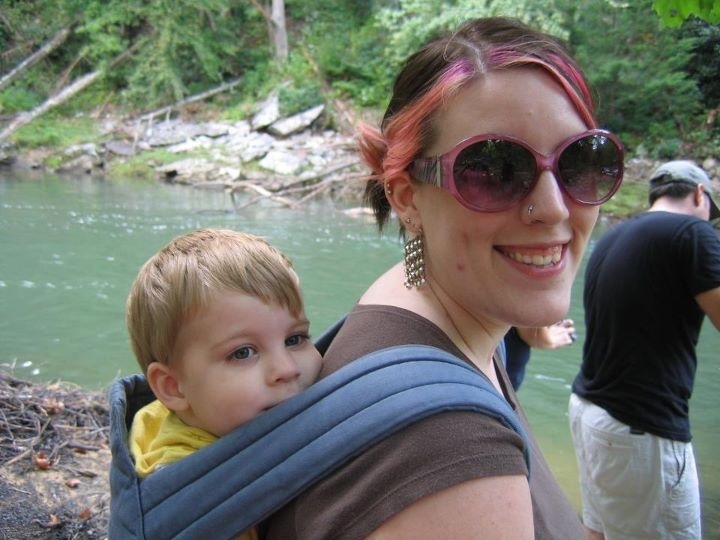 From Charise: Babywearing helped Baby to love exploring nature very early on. 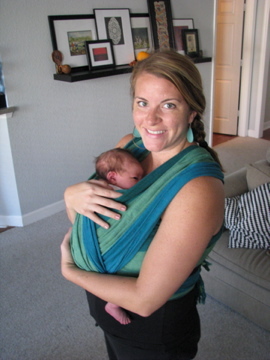 Shannon at The Artful Mama practices babywearing with her son Little Man so she can accomplish all the tasks she needs to do when she parents alone. Here they are walking their dogs. Shannon has also continued to wear her son through her current pregnancy. This photo is of the two of them while she is 7 months pregnant. 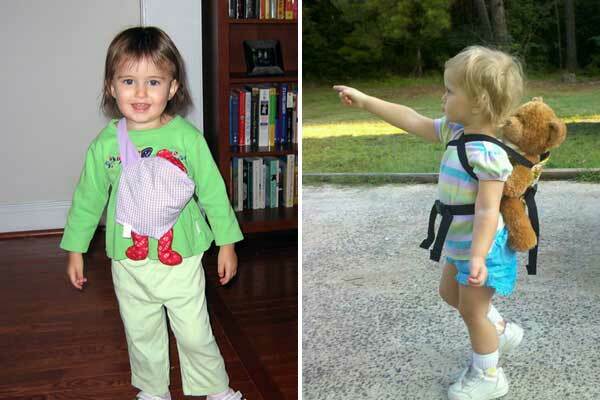 Toddler-wearing has enabled Shannon to carry a sleeping Little Man and all of their packages upstairs in one shot – which has been a real energy and time saver. 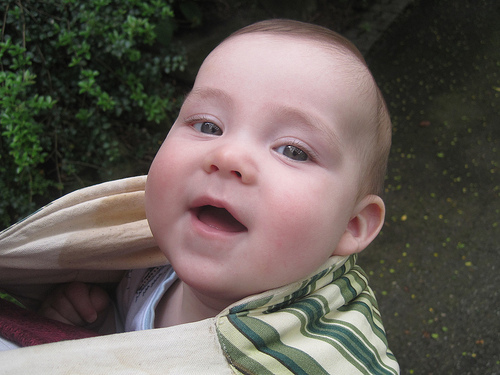 From Jorje: Jorje enjoys family walks around her neighborhood. 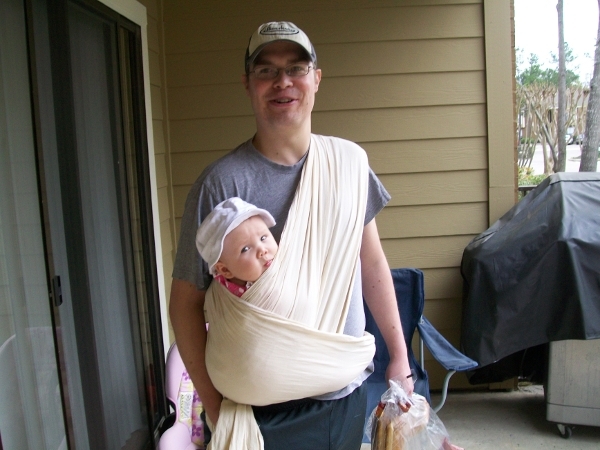 Here she is, wearing newborn Spencer in a Moby and carrying big sister Sasha on her back. 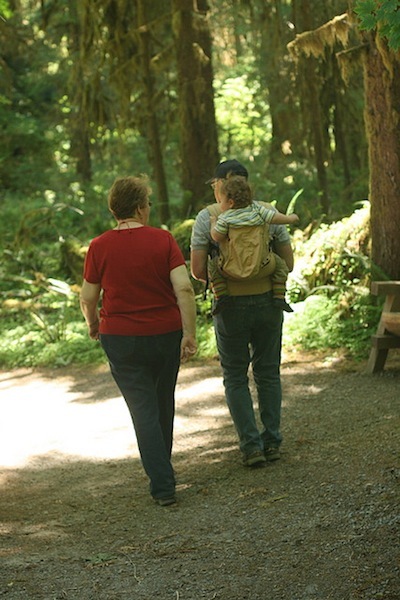 Tell us: What does babywearing look like in your family? These are so sweet! I totally had to read and enjoy them all. The ducks one is brilliant! This makes me so excited to get my new organic Ergo and to start wearing Baby #2 when she arrives! 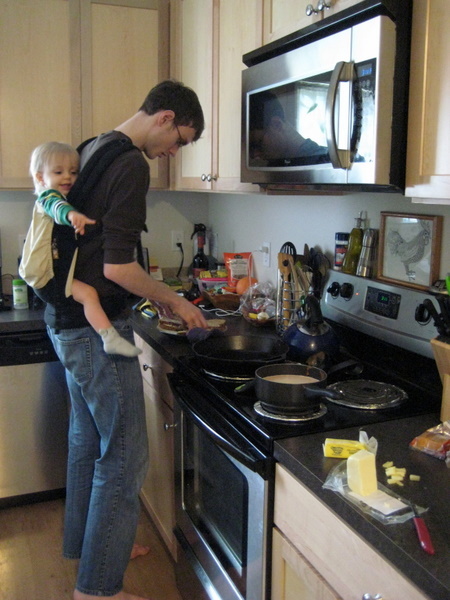 Love all the pictures of happy babies snuggling with their parents (and uncles)! Loved all these photos. Especially the ones of the three year olds. My daughter is now 2.5 years old and I am not ready to be done wearing her! I love these photographs. 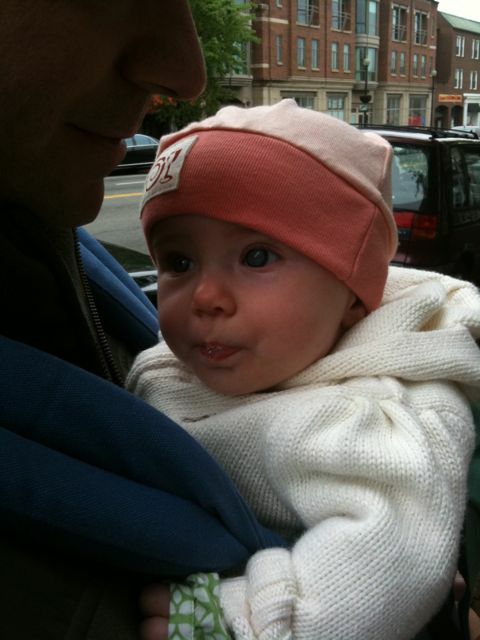 When my daughter was a newborn, she often would fall asleep when I was wearing her, especially in the library.